Sometimes jailbreaking may result in iPhone 4 not starting or turning off. For this very reason you may want to restore your iPhone. Recently, when I jailbroke my friends phone with 4.2.1 OS, it worked perfectly but Cydia disappeared so I simply erased the entire iPhone and guess what? It refused to boot again. I tried restoring the firmware via iTunes but unfortunately it did not work and started giving various types of errors like 3194 and 1013. The iPhone 4 with 4.2.1 OS was previously jailbroken using Greenpoison on Windows 7. The device was getting stuck at boot screen and would restart itself. It would not shut down when power button is pressed and neither pressing and holding the home button and power button simultaneously helped. Well, if you too experienced the same problem in Windows 7 then here’s what I did. This fix applies for all OS from 4.X.X. Hold both the power and home button simultaneously and connect the cable to your computer. Now, when you try restoring the same firmware you might get a 3194 error. Start iTunes and restore your phone by holding shift and clicking on the restore button. Choose the firmware and restore. That’s it your phone should now be fixed. 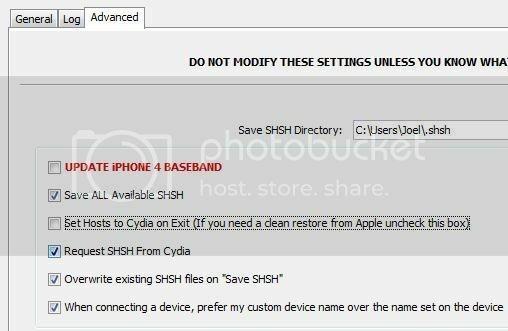 Click on the Advanced tab and uncheck the option “Set Hosts to Cydia on Exit”. Now restore the firmware, this should work out. If you are using Redsn0w to jailbreak your device then follow the steps and jailbreak the device (download Redsn0w). While jailbreaking the device may be stuck on ‘installing bundles’, leave it like that for 10-20 minutes. Once, it is done it will be done! Now, even after all this if you are still experiencing the device going into recovery mode and not booting then you need to kick it off from the recovery mode for one last time. Use TinyUmbrella to do so. Voila! After all this long process you should have your phone fixed. If you still have doubts and experience any problems then feel free to ask here.